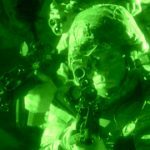 BAE Systems has been awarded a potential five-year, $434 million contract to integrate night vision and thermal targeting technology into head-worn goggles for the U.S. Army. The contract has a $35 million initial value and was awarded through the military branch’s Enhanced Night Vision Goggle III and Family of Weapon Sight-Individual program, BAE said Monday. According to the company, U.S. soldiers use a goggle platform to recognize and identify targets as well as a weapon mounted device to engage targets during surveillance missions. The company will work to combine the two tools into a single platform with the goal of helping military users acquire targets in any lighting and weather conditions. BAE will manufacture the integrated ENVG III/FWS-I systems at the firm’s Hudson, New Hampshire, facility.